A little while back, I wrote an article on Sophia Natale (which you can read here) one year on from diagnosis of her back injury. I asked her about what the past year had been like for her, the lessons she has learned, her new practice, other interests and future goals. I liked this idea of reflection – especially after a whole year – and my wonderful Editor, Deborah Searle, supported my decision in making this an ongoing series. Introducing the first person (and very exciting upcoming dancer) of the One Year On series: Zachary Lopez. What was it that you did last year and why did you decide to do it? How were you able to do this last year? Zachary Lopez. Photo by Fiona Cullen. “Not only did I work with amazing choreographers and teachers last year, but I really got inspired by my peers in Pre-Professional Year. They brought something different everyday to the studio – something to bounce off and learn from. I was introduced to an array of national and international dance artists, so many inspiring people and I couldn’t pick a favourite. I was invited into the rehearsal space of Sydney Dance Company, understudying works by choreographers Andonis Foniadakis and company dancer Charmene Yap – both invigorating experiences. It can be hard being away from home with a physically and emotionally demanding schedule. Was there ever a moment where you no longer wanted to do it? And the most exciting question, what has happened since and what does this year have in store for you? “Well! It’s been a whirlwind since ending 2014 and a very busy beginning of 2015. I was successful with my application for the Artstart grant from the Australian Council for the Arts for 2015. This grant will enable me to explore, create, grow and experience other avenues within dance throughout Australia and Europe. Zachary Lopez. Photo by Peter Greig. 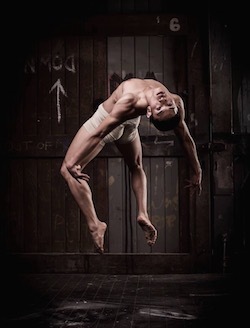 I have assisted Rafael Bonachela as a temporary Rehearsal Director for his new work Frame of Mind, whilst accepting a role as an Associate Artist with Sydney Dance Company doing project based work. The biggest lesson you have learned over the past year is…. Where would you like to be this time next year? Both the physical place and in your career. And finally, besides dancing, what else do you do?